This one tip will make your videos better: Move the camera to meet your subject. If you’re shooting children, get low. If you’re shooting skyscrapers, try an aerial view. And if you’re shooting a surf sequence, find the nearest point break and get into the barrel of the wave. The only problem with the latter scenario is budgeting for an HD camera, underwater camera housing, and an expensive insurance policy since underwater housings fail with surprising frequency. 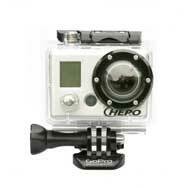 Or, you could pick up a GoPro HD Hero ($259 to $299 depending on configuration). The HD Hero is a tiny camera designed mainly to shoot HD video (1080p at 24 fps, or 720p at 60 fps for high speed subjects or buttery smooth slo-mo in editing) and 5-megapixel stills in adverse conditions. It comes with an underwater housing and various bits for attaching it to almost anything. On its website, GoPro shows it in action on a surfboard, a racecar, and on motor cross bikes. But this isn’t a typical consumer camera: You can’t look at images you’ve taken without a computer (the camera has no LCD). You can’t change the focal length or adjust the exposure. And the HD Hero only has two buttons: On/Off, and Start/Stop. It’s what the camera can do on the cheap—shoot up to 180 feet under water, mount to almost anything, continue to work while moving at over 100 mph—that makes it stand out. As a professional photographer and journalist whose work often falls in the “adventure” category, I couldn’t wait to give the HD Hero a spin. The plan was for a progressive series of (ab)uses. I started with a quick test under the faucet to be sure the seals worked, moved on to a few lazy dips in the Atlantic Ocean off Cape Cod, and finished with a multitude of high velocity kite-surfing crashes in the Caribbean with the camera mounted, at various times, to the helmet, the board, and the kite. The image quality for stills was good, and even better for video, with everything from a few inches in front of the camera to infinity in sharp focus. In good light, colors where crisp, but because the camera runs full-auto-everything, and the lens offers such wide coverage, I sometimes had issues with wonky exposure, white balance, and color shifts. Build quality—of the camera and housing, at least—was also solid. But the plastic mounting components left something to be desired. Once, I had trouble getting the camera not to flop over when I had it mounted to the kitesurf board. I used a screwdriver to finally get the joint tight enough—but at the end of the day realized I had wrecked the plastic teeth by over-tightening. I also had trouble getting the quick release to disengage from the board mount at the end of the day because of sand getting jammed between the components. Sand is an insidious pathogen for mechanical parts, so while I was thrilled with how well the board mounting system worked overall—I would carry a few extra mounting components and quick releases if you take the HD Hero in hard with the salt and sand. Any review of the HD Hero would be remiss not to mention the camera’s clunky menu system. With no rear LCD (there is a small info screen on the front), and only two buttons, clicking through and configuring the camera takes patience. Once configured, however, using the camera is mostly excitement/adrenaline-proof: Turn it on, choose video, stills, or timed, automatic stills (at 2, 5, 10, or 30 second intervals—perfect for time-lapse), and hit start. The HD Hero is for people willing to invest a little extra time to get shots that would otherwise be prohibitively expensive, or risky, to film. It’s for sports enthusiasts whose hobby includes not just the activity itself, but sitting afterward at a computer messing with the images and footage gathered during a session. Though not for most consumers, the HD Hero will be a godsend to advanced amateurs and professionals who don’t want to risk trashing an expensive HDSLR. The HD Hero has some compromises, but for $300 it’s a great deal.